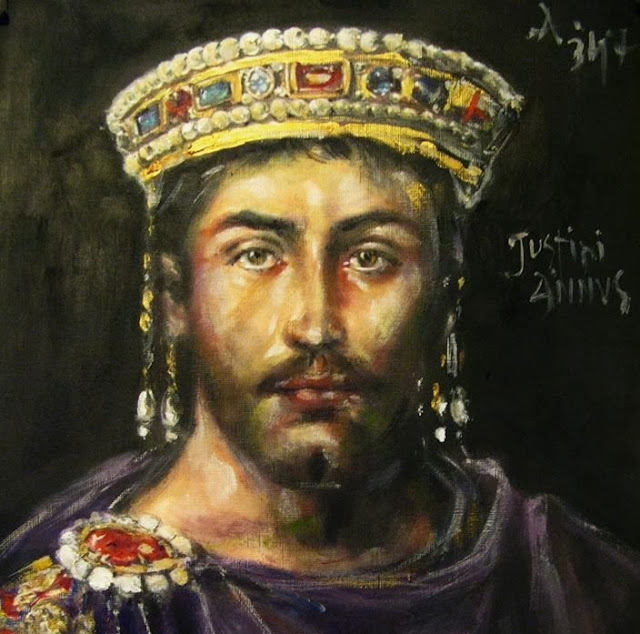 Justinian I or as he was known Justinian the Great was the grandson of Justin I and was born in Bedriana in Dardania. He rewarded the country which raised him as no other Illyrian emperor before. Thus, he built his hometown and besieged it with high walls in order not to be affected by barbarian invasions. At his own expense he built a magnificent water supply in the city in order to have water in all the seasons. For his homeland he built 157 castles starting from the Danube River to Epirus in order to secure these territories from the invasions of the various populations. It is his merit that a large part of the Albanian territory survived the Slav invasions. Justinian married Teodora, a debilitating woman who had started her life as an artist, but since he met Justinian, he fell in love with him and began dedicating himself to the Emperor and the Lord. The woman was his political partner, and one of the most talented counselors who would save him on several occasions, even when his throne was endangered. Justinian's dream of foreign politics was to rebuild once again the Roman Empire, and he devoted most of his life to this dream. He had several capable commanders like Belisari and Naser who undertook military campaigns to conquer the territories that Justinian had designed. So in a short time he invaded the Vandal Kingdom in Northern Africa, Sicily, Naples and Ravenna. He fought against the Ostrogots and got captive their King, just like the king of Vandals. Conquered the South-Eastern part of the Iberian peninsula by destroying the German Kingdom there. But as he undertook military campaigns in the West, Slavic barbarians were settling in the most emblematic Illyrian lands, and after they done more than a century of robbing campaigns, they wanted definitely to settle in this country. He refused to let them in Illyria, but in the 7th century Emperor Heraklid ruled the Slavs in the Illyrian territories, in today Croatia and in Slovenia, since the tribes of Bulgarian origin had entered the in the Eastern part of Illyria by force, later came the Serbs who settled in the Danube, North of Dardania. The Russian Encyclopedia of 1954 reflects the borders of the Serbian Kingdom at the beginning of the 19th century, extending north of Nis in today's Belgrade, and there is reflected the expansion of Serbia at the expense of ethnic Albanian lands. From people who barely pulled their heads out of the forest, the Slavs became gradually the lords of most of Illyria by bringing the country into a period of medieval darkness and poverty. Justinian, in order to not have problems with the Persian Empire, signed a peace agreement with them for 50 years. In 532, he destroyed the Niches' uprising, a battle between blue and green for religious affairs, related to the views of each party had for the God. Justinian, did not keept any side, and this led to the conflict with both sidesagainst him. They declared emperor another Illyrian, the grandson of Anastasios, and Justinian became ready to leave the throne but Theodora did not let him and so through diplomacy and his army he managed to suppress the rebellion and strengthen his power. Justian was the initiator of the great codification of the Roman Law, seeing that it was no longer fit to the new relationships that had been created. In fact, the Roman Law was a slave and owner right, but in the conditions of Christianity the slaves were freed and thus a new kind of enslavement called "the column"s and then feudalism began. So when the economic relations had changed, the law that regulated these relationships had to be changed. In fact, many laws were made because each emperor issued his orders, making thus the justice very confusing. For this he charged a group of lawyers who codified the right by extracting the Corpus Juris Civilis, the civil law code. After a three-year work, a summary of Roman law cases called Diageste was made, a collection of the writings of the old Roman jurists. Institutions were created to help students study this right at school.